A brother who was a deacon in his church was horribly martyred for the faith by radical Middle Eastern terrorists just outside of Jerusalem. You know all about the terrorists' religion, but I won't name it here since some people might get upset. 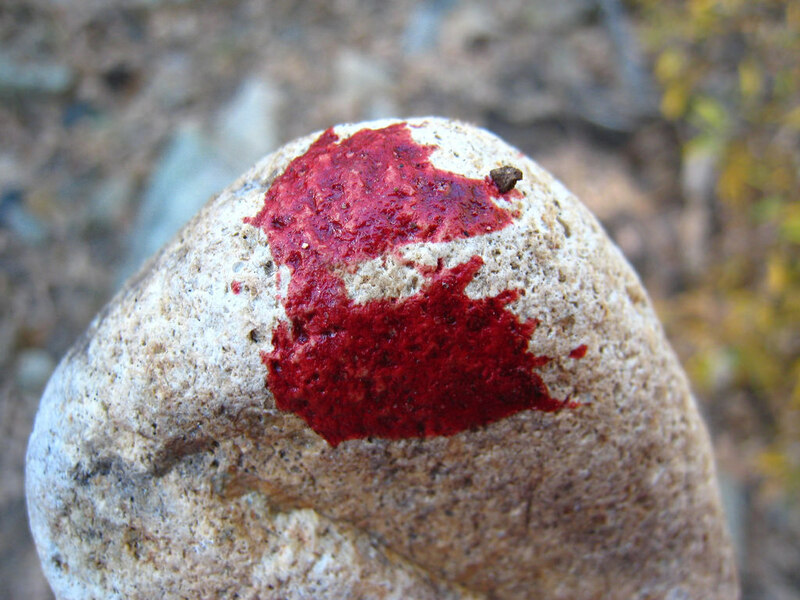 In his final moments the deacon prayed for the terrorists who were brutally stoning him. It was horrible. All he did was kneel there and pray while they kept throwing rocks. You have to wonder, what would have happened if he or someone nearby had had a gun. I just can't believe how foolish some Christians are in this age of terrorism. Don't you think that we should at least check our Bibles to make sure we know how to react to these kinds of threats and not just rip texts out of the Bible to fit our crazy ideas? I mean, what if these guys, Stephen and Ananias, had treated the terrorist Saul the way Christians in America treat Muslims? So, why recount this short story in this way? Because we forget that there's nothing new under the sun. Think about the current tenor of public discussion today when it comes to foreigners and terrorists. A large segment of the United States (and within Christian churches) demand that we keep the Muslims away - don't let them in, build the wall, keep America Christian. Except that's not biblical. In fact, it's in direct opposition to what the Bible teaches about dealing with foreigners and our enemies. Should we think that Jesus didn't really mean that we should love our enemies? Or maybe Jesus just didn't understand about modern-day terrorism? Were the early Christians naive about the threats we would face today? They lived it long ago and knew exactly what they were talking about. The story of Saul is a story of a religious terrorist murdering Christians. The story of Stephen is a man killed by Saul's terrorist cell while Saul stood by saying how right they were to do it. The story of Ananias is the story of a Christian who trusted God enough to let a man he feared into his home despite his associations with terrorism. And what did Ananias learn? He learned that by the grace of God even a terrorist could become an apostle of the Lord Jesus Christ! Of course, the analogy between today and Saul/Paul is not perfect, but the underlying principles are the same. First, we are to love our neighbors, be kind to our enemies, pray for those who hate us, and bless those who curse us. We cannot do that from behind walls. We cannot do that if we only witness to the neighbors we like or who look like us. We cannot do that if we lock the foreigner out of our country. Hate has no place in the heart of a Christian. Second, we are to preach the gospel to all nations and all men, not just the ones we think are nice (anybody remember Jonah?). The gospel of Jesus Christ is not for the good people. It's for the broken, the sinful, the hateful, and yes even the terrorist. What is it we are afraid of? Are we afraid that the message of Christ cannot stand before the lies of Mohammed? Are we afraid that Christ cannot protect His Church? Are we afraid that the Gospel is not enough to change the hearts of the lost? Do we think the conversion of Saul was just a one-off? Are we afraid they might repent and God would show them kindness too? Have faith Christians! Stand tall and let the world flood in to your doorsteps and hear the gospel of Jesus Christ! Put away your baskets and let your light shine! 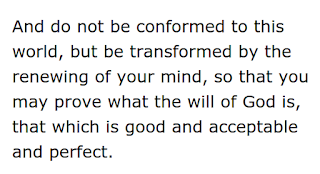 What is meant by "the renewing of your mind" in Romans 12? How does it happen? Why is this a commandment? What's actually going on here? These aren't just hypothetical questions. Paul links this transformation to the most important thing in the universe. By the renewing of our minds we prove that which is good and acceptable and perfect - the very will of God. 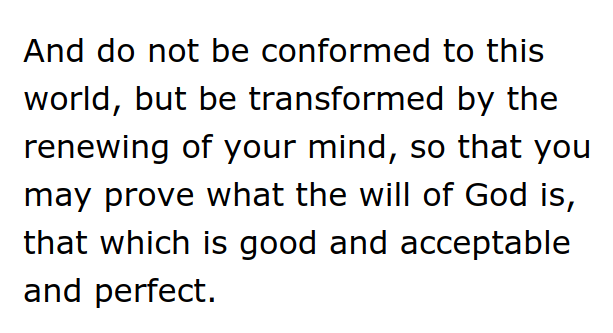 If we as Christians want to do that which pleases God we must be transformed by the renewing of our minds. So how? First, we must see what the passage implies. It implies that our minds need to be renewed. It implies that there is something fundamentally wrong with our minds and that if that problem is not resolved we cannot do what is good and acceptable in the eyes of God. That's not just a little problem. It's a rotting mental disease! In fact, just a bit earlier in Romans Paul points out that the mind that is not renewed is more than just diseased, it's positively pathological. The mind apart from Christ is death, hostile toward God, rebellious, unable to even do good or please God. But what do we mean by "the mind"? The mind encompasses the thoughts, but it is more than that. It's the will deep within the core of our being, our hearts. Will drives thought and we are born corrupted to our very core by sin. Influenced by the will is our brain which is corrupted along with the rest of our body. So our corrupted will takes control of our corrupted brain and breeds even more corruption. But God begins a work of transformation in us when we are saved, changing us into the image of Christ. However, we are not simply passive actors in this process. Nor are we left to fight through this by ourselves. We have a Helper, the Holy Spirit. And what does the Holy Spirit do for us? He reminds us of the words of Christ and the things of God as revealed in Scripture (John 14:25-26). And there is our answer. This is how we are transformed by the renewing of our minds. The renewing of our minds is a work of the Holy Spirit as he takes the thoughts of God as they are recorded in the Bible and brings them to remembrance. Those thoughts we never would have had before we now find in our minds. Those ideas that before we simply could not understand we now find made clear to us as the Spirit of God works in our minds and transforms us from the inside out so that our thoughts are in harmony with God's thoughts. So what is our part? To listen! It is our responsibility to hear the words of God by reading the Bible, studying what God has said, going to Church and hearing the faithful exposition of scripture, and thinking about what we have read and heard. Then, as we go through our day we will find that those words are coming back to us. When tough times come promises and commandments of God that we read long ago leap back into our minds. When sin tempts us we remember what God has said and are convicted. When it is time for us to bear witness to Christ, the words of scripture are ready in our tongues. At those moments we have a choice. We can obey or fight. This is what Paul is talking about when he says "Do not be conformed to this world, but be transformed by the renewing of your mind". We are to push aside the old mind set on the flesh allow the Spirit of God to cause the word of God to so richly dwell within us (Colossians 3:16) that it changes our very thoughts and brings them captive to the obedience of Christ (2 Corinthians 10:5) resulting in our lives being radically transformed from the inside out. The Spirit of God spends His ministry working this transformation within us, but it is not unilateral. We have the opportunity to work with Him and to accelerate the process as we listen and obey. Let's take another look at Romans 8:5-14 and see how this comes together. For those who are according to the flesh set their minds on the things of the flesh, but those who are according to the Spirit, the things of the Spirit. For the mind set on the flesh is death, but the mind set on the Spirit is life and peace, because the mind set on the flesh is hostile toward God; for it does not subject itself to the law of God, for it is not even able to do so, and those who are in the flesh cannot please God. If you do not have the Spirit you are unable to think clearly. If you do not have the Bible and read it you are starving your mind of the food the Spirit uses to transform you. If you do not listen to the promptings of the Spirit then you are setting your mind on the flesh and fighting against the change that God is making within you. Faith in God or some other divine being dropped from 96 percent in 1966 to 83 percent. Twice as many teens today feel their parents have tried to run their lives too much (24 percent, up from 12 percent in 1966). Fifty years ago, the five most admired famous people were John F. Kennedy, Abraham Lincoln, George Washington, Lyndon B. Johnson and Helen Keller, in that order. Today, pop culture rules, as President Barack Obama, Taylor Swift and Beyoncé top the list, with Selena Gomez tying Lincoln for fourth place. Selena Gomez is just as admired as Abraham Lincoln? George Washington and Helen Keller are taking a back seat to Taylor Swift and Beyoncé? That's not just a problem, it's a catastrophe! 50% of teens support murdering babies by abortion. 62% of teens support the twisted practice of homosexual "marriage". Newsweek focusses in on race relations since that factored highest in the survey (even higher than it did in 1966!). That's understandable, but for the purposes of this blog let's take a long look at those two statistics above and what they signify today and for our future. 50% of teens support infanticide by abortion. That means one out of every two teenage kids you meet believe that tearing a child apart in the womb is no big deal. To them a baby that hasn't exited the birth canal isn't a person but a thing. Don't minimize this attitude. As I've written elsewhere, a generation that sees people as things has no compunctions against murder when they decide that some people are less than human. The redefinition of what a human is is tied directly to the first statistic, a rise in atheism. Even more so when we realize that the "god" that a large majority of these teens "believe in" is not the God of the Bible but a "force" in nature or nature itself. If God is not the God of the Bible then we are not created in God's image. If we are not created in God's image we have no inherent value. We are simply sentient biological organisms no different than a dog or a bug and when a person isn't worth the time to society anymore they can be exterminated for the good of the many. As one of the most popular sci-fi franchises in history has proclaimed now for decades, "The needs of the many outweigh the needs of the few, or the one." So why not kill babies? They don't contribute anything. Why not kill old people? They're useless now. Why not kill the mentally disabled? They are leeches on society anyway. And what about that second statistic? 62% of our teens in the United States say they support homosexual marriage. That's just the ones that support it. How many just don't care about it one way or another? Not only does this ignore the clear declarations in the Bible against homosexuality, it ignores nature as well. Like the apostle Paul said, they give up their natural state and burn in their desire toward one another, men with men committing shameful acts and even the women burning in their desires for each other. This kind of denial of even the most obvious biological distinctions comes from a worldview that denies God, denies objective truth, and believes that people are fundamentally not responsible for who and what they are. They no longer choose to sin, they are a product of their genes and their environment. And even their genes are no longer determinative of who they are. If a boy with an X and a Y chromosome decides one day that he is a girl and his name is now Jane we are all obliged to call him by female pronouns, call him by his female name, allow him to walk into female bathrooms, and completely ignore what is blatantly obvious. We must treat him as a girl or we face social sanctions. The new morality demands that we live a lie and support others in their lies. What's more, to point out the Biblical and logical problems with these positions is now considered "hate speech". Just by disagreeing with the blatantly murderous or illogical actions of others, those who adhere to a Biblical model are accused of hate and lumped into the same category as the KKK and the Nazis. No longer is tolerance of different ideas the highest value. Now the only value is toeing the political line, or else. So what are we to do as Christians when we realize that these statistics show our country is not only in trouble, but racing at break-neck speed into disaster? Should we be angry or fearful? Should we hide? Should we run away? Should we strike back? None of the above! As Christians we are called to speak the truth in love. Our motivation is to redeem lost souls and protect people from the dangers of sin. We do this by presenting the truth. And where do we get the truth? From the Bible. 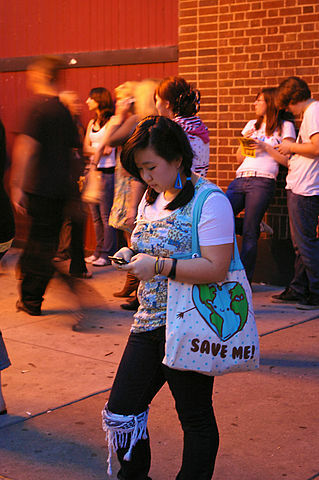 These teens desperately need to hear the truth of the gospel of Jesus Christ. Their distorted views and failing ethics are not going to be resolved through therapy, better jobs, better race relations, a better environment or a just society. Their only hope is that they find forgiveness in the blood of Christ. We must understand though that the opposition is growing and it's growing more vitriolic. We must walk carefully and ensure that we are not responding to sin out of hate. We must be aware that speaking up is likely to cause others to hate us more, not less. For some of us, we will likely face unemployment, prison or worse. That is to be expected, but we must make sure that when they do lash out against us they don't have a good reason for it. They should hate us for the truth, not because we hate them. How little is our faith? I am increasingly convinced that our generation of Christians has the least knowledge of the riches we have in Christ of any generation since the apostles. We who have been adopted as sons behave like squatters in the throne room of God. Our crowns bought with the blood of Jesus are tossed about like plastic dollar store baubles. The inspired word of God is little more to us than a doorstop holding ajar the gate of heaven. The table of the Lord is a burden to us blocking our way to the speedy exit of our churches. Our songs are hymns to our own happiness. We despise the body of which we are a part pronouncing it all gangrene, but assessing the draining boils and pustules of our own lives pure enough for a holy God. Our High Priest is our mascot, the Spirit is but a nuisance, and the Father merely our celestial vending machine. And in the midst of it all we kick open heaven's door, stomp into the throne room, and take the best seats at the table in complete confidence that none could be better than we. What will be our condemnation when we stand before God? If only we knew the riches of Christ! The proportion of the population who identify as having no religion – referred to as “nones” – reached 48.5% in 2014, almost double the figure of 25% in the 2011 census. Those who define themselves as Christian – Anglicans, Catholics and other denominations – made up 43.8% of the population. In the world of sociology that level of change in such a short amount of time is earthshaking news. It means there is a fundamental change in the structure of society that is absolutely unprecedented. In three short years 23% of the population decided that there is either no god or that they want nothing to do with a specific religion. For the first time in centuries the UK can no longer call itself a Christian nation. The numbers though hide the reality that the problem is much deeper and will continue to accelerate. 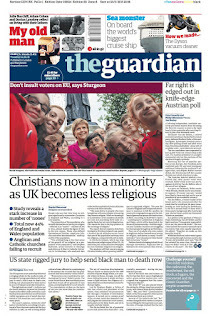 As the article points out, "Half of all Christians in England and Wales are over the age of 55." In addition, for every 1 person the Church of England recruits they lose 12. What's more, that 1 person they gained came from another denomination. Put together that means that the rapid decline of Christianity in England will accelerate in the next 30 years as the older demographic dies off. The real story though is how the Church of England is responding to the news. A spokesperson commented, "The increase in those identifying as ‘no faith’ reflects a growing plurality in society rather than any increase in secularism or humanism. We do not have an increasingly secular society as much as a more agnostic one." That's simply not credible. 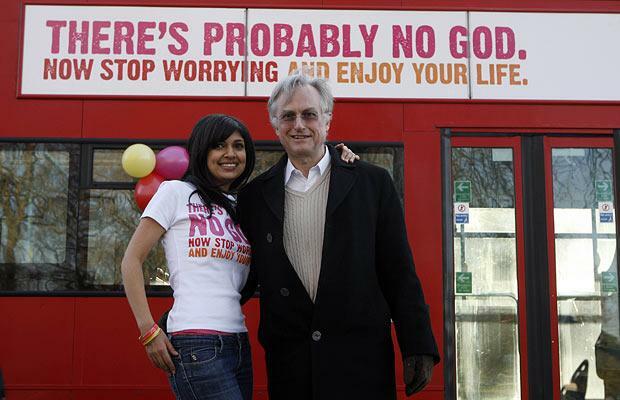 Secularism has been on the rise in the UK over the last decade with the aggressive work of the New Atheists including broad advertising campaigns declaring such slogans as, "There's probably no God. Now stop worrying and enjoy your life." England has responded by showing every sign of secularization including an every growing denial of Christian values. Of course some people leaving Christian churches will gravitate toward New Age religions, but even then they have a secular mindset. What is really concerning is the complete lack of understanding by the Church of England that their defection to liberal theology has made the change all but inevitable. By denying the authority of Scripture and playing along with their secular foes they have given up without a fight. What's truly amazing is that there are any Christians at all left in the United Kingdom. But before we here in the United States take a deep breath and thank God that we live in the good ol' USA we might want to consider the historical reality that what happens on the east side of the Atlantic ocean crosses to the west side in short order. In our bigger cities, and particularly the bigger cities on the East and West coasts there is a similar race to atheism, agnosticism, and secularism and for all the same reasons it has been happening in the UK and Europe. And what happens in the cities spreads to the rural areas as the elites of society spread their gospel of secular humanism through news, entertainment, and educational institutions. Why is New Atheism so full of hatred for Christians? Why is tolerance no longer the defining value of secularism? What is the "spirit of the age"? 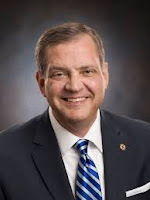 Not long ago Al Mohler, one of the preeminent Christian culture commentators, spoke at Dallas Theological Seminary about the New Atheism, where it came from, and where it is headed. In his series of four lectures he outlines the history of atheism, the assault of New Atheism on theism and where things are headed. Any Christian who wants to know what the "spirit of the age" is needs to take the time to watch and really digest what Mohler presents here. This is not your hippie uncle's liberalism. It is angry, irrational, and increasingly violent in expression. Tolerance is only for ethnicity and gender identity, not ideology. Think long and hard about what is said here when you look to send your child to college. "You think you're so [expletive] cute with your little column. I read your piece and all you want is attention. You're just like Bill O'Reilly. You just want to get up on your [expletive] soapbox and have people look at you." Nearly all my professors are liberal. Isn't that a problem?